The best way to determine post tension depth and cable location is with the latest ground penetrating radar (GPR) technology. Experienced technicians can locate and map these concrete reinforcements to ensure they are not damaged when cutting or drilling is necessary on the slab. Our technology can also calculate the depth of the cables as needed. In addition, GPR can be used to locate rebar, conduits, underground storage tanks, utilities and even unmarked graves in both soil and concrete. This provides critical information on not just support structures but utilities and other obstructions. 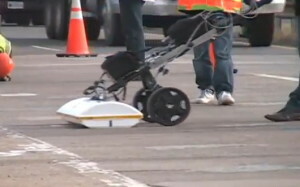 How Does GPR Locate In-concrete Cabling? Ground penetrating radar equipment does just as it sounds like it should; it sends out radar waves which penetrate the ground. These waves hit the reinforcing cables, steel rebar and other structures within the concrete and bounce back. This allows the technician to map a grid of what lies below. Why Use GPR To Find Post Tension Cables? A post tension cable is a key support for concrete construction. It allows builders to use thinner slabs of concrete but still support the same amount of weight. These cables also make it possible to use fewer support columns. During construction, the steel cables are laid into the area where the concrete will be poured. Once it is poured, the cables are tensioned with approximately 4000 thousands of pounds of pressure. Changing The Structure Of A Major Development? Thanks to their high tension, these cables can cause serious injury or death by ripping through the concrete slab if they are cut or damaged in later renovations. Cutting through one of these cables also compromises the integrity of the structure. This is why it is vitally important to avoid these cables when cutting or drilling on a concrete slab. Hiring an experienced technician to map the support grid in your concrete slab minimizes the risk of injuries and delays. Who Would Benefit From Our Scanning Services? GPR is used to locate concrete reinforcements during excavation, renovation and remodeling. No matter if you are drilling to install electrical conduits or cutting to repair a leaking drain pipe under your slab, it can help protect you and the integrity of your home or office. Ground Penetrating Radar is often used prior to plumbing repair, duct-work installation, putting in sprinkler systems and adding drains. GPR mapping can reduce both cost and risk on your job site. Choosing to utilise GPR equipment means you are creating safe work environment for your workers. It also means you have less risk of damage to the original structure.